Socrative is one of the most well known and widely used student response systems and for good reason. It is a robust, intuitive tool that makes forms and surveys easy to create for teachers and a snap to join for students (for example, no login required — just a class code). Questions can be prepared in advance or posed on the fly in a variety of formats such as T/F, Multiple Choice, and Space Race. Answers can be displayed on the screen anonymously. In the hands of students, Twitter is commonly viewed as a gossipy distraction that takes students away from the important work done at class and home. But more and more teachers are recognizing its value as an easy-to-use and quick-to-setup backchannel and student response system. Students sign into personal accounts (when age-appropriate) or a class Twitter account. Using a unique #hashtag, they post comments, responses, and questions related to classwork. Teachers can project the stream onto the class screen for everyone to see. Polls, forms, and surveys are great options when teachers need to create sign-up sheets, push out formative assessments, auto-grade quizzes, and more. 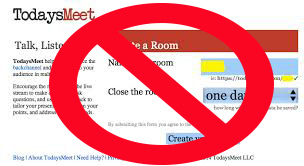 Today’s Meet made it part of an easy-to-access classroom ecosystem that could be quickly shared (anonymously) with all students and intuitively used. In its place, most teachers will first think of Google Forms because of the breadth of Google’s penetration into the education market (last year, G Suite for Education had over 70 million users and more than half of the primary/secondary school market), but there are other options that offer more choices, in different ways, and might be the perfect solution for your class. Pear Deck is an interactive slidedeck that integrates polls, surveys, and quizzes into lesson planning seamlessly, painlessly, and intuitively. Teachers sign in with their Google or Google classroom account, the latter giving them the ability to import the class roster. Students join the presentation with a teacher-provided class code. Once in, students see the same slides the teacher displays on the class screen including interactive assessments pushed out as multiple choice, drag-and-drop quizzes, short answer, or a drawing. From their dashboard, teachers can monitor who responds and how, display results anonymously on the class screen, and analyze data. Pear Deck can also be used as a warmup/exit tick or a backchannel. Warmups are 3-5-minute unassisted class starters to assess what students know about a topic or remember from a previous class. Teachers can then review or reteach as needed. Students are expected to complete these by themselves — with no collaboration. Exit tickets are quite similar but act more as formative assessments to measure knowledge gained from the class as a last step before they leave. Flippity is an add-on to Google Sheets that appends a ton of functionality to what is typically considered a data-intensive environment. Because teachers are familiar with Google Sheets (if you’re one of the millions of Google schools), it is easy to create warmups and exit ticks using Flippity templates like a quiz show, flashcards, crossword puzzle, hangman, memory game, word search, and more. No registration is required but students must have a Google account to use it. Flipgrid poses questions which students answer in a (very) short video format. All class answers are collected into a grid that can be shared and viewed. The class is easy for a teacher to set up. Students enter with a code (no registration required) and add their answer with the digital device camera. They love the video format and can redo any video they aren’t happy with. Today’s Meet will be missed but with a touch of creativity and flexibility, you can accomplish the same goals and more by using any number of these stellar tools. 2 Responses to Today’s Meet is Closed. What are your Alternatives?